No donation is too small! The Foundation has received donations as small as $5 and as large as tens of thousands of dollars, as well as real estate donations. School children have conducted fund raisers resulting in nickels and dimes coming to the Calaveras Community Foundation. Please give as much as your heart and wallet allow. All those who give donations will receive a letter acknowledging the contributions. Please contact us for more information and we welcome your questions! Use the Donate button below to make a secure donation to the Calaveras Community Foundation via PayPal. Note: We incur a 2.2% processing fee on your donation plus a 30 cent transaction charge, so your donation of $25 becomes $24.15. We appreciate every penny. Click on the DONATE button below use our PayPal option. 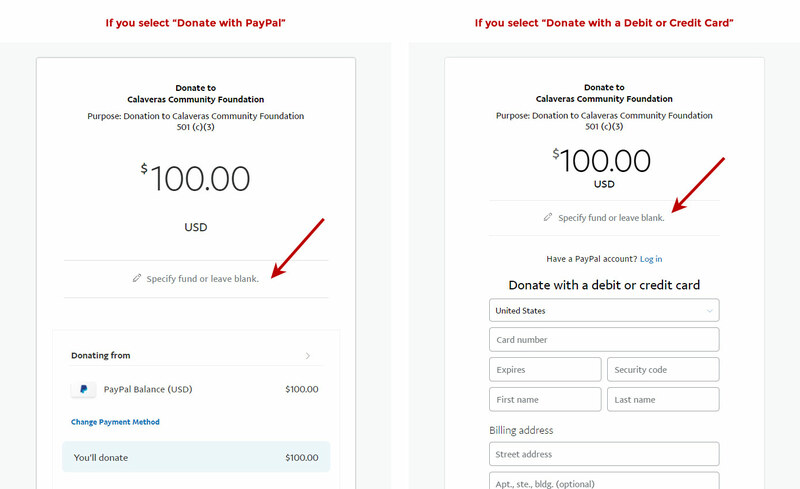 At the final PayPal process you will have the ability to specify a fund in the “Specify funds or leave blank” area (click here to see an example of where you will enter that info). When you do not indicate a specific fund, your donation will be applied to the Foundation’s Unrestricted Funds. Click here to discover other ways you can give to the Calaveras Community Foundation!